Our latest (April 2019) chapter newsletter can be found here. The Northern England Chapter Board are very proud that our Vice President, Sarah Orton has been awarded the ISACA Paul Williams Award for For inspirational leadership in raising awareness of the SheLeadsTech program. Full details can found on page 8 of the award pack along with full details of the other recognised for their achievements from across the globe. “In ISACA’s 50th year, our entire professional community is not only reflecting on its rich past and industry impact, but is forging ahead and innovating its future,” said ISACA Board Chair Rob Clyde, CISM. “David Samuelson is the ideal leader for ISACA as we continue to grow and expand globally. His far-reaching experience in learning and technology innovations and his latest non-profit executive leadership role will be tremendous assets, inspiring the entire organization as we advance the positive potential of business technology worldwide.”Samuelson will assume his role as ISACA CEO on 1 April 2019. 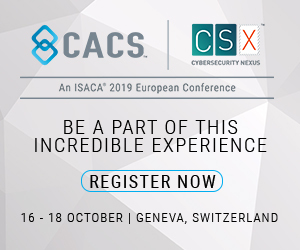 He joins ISACA following executive leadership roles as founder and CEO of Pinpoint Learning; executive vice president and general manager at Capstone Publishers; and more than 15 years in executive roles at Pearson plc. In recent months, Samuelson served as CEO of GreaterGood.com and on the board of its nonprofit partner, GreaterGood.org. New Event - She Leads Tech in Manchester on the evening of the 21 May in Manchester.